No matter how visually appealing or content-packed a Web site may be, if it’s not adaptable to a variety of situations and reaching the widest possible audience, it isn’t really succeeding. 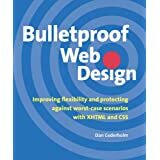 In Bulletproof Web Desing, author and Web designer extraordinaire, Dan Cederholm outlines standards-based strategies for building designs that provide flexibility, readability, and user control–key components of every sucessful site. Each chapter starts out with an example of an unbulletproof site one that employs a traditional HTML-based approach which Dan then deconstructs, pointing out its limitations. He then gives the site a make-over using XHTML and Cascading Style Sheets (CSS), so you can see how to replace bloated code with lean markup and CSS for fast-loading sites that are accessible to all users. Finally, he covers several popular fluid and elastic-width layout techniques and pieces together all of the page components discussed in prior chapters into a single-page template. Today I got a lot of fun when started reading this book. Yes, I read it completely without a pause during several hours. So little more about book itself. Unlike other XHTML/CSS books that examine what’s theoretically possible, Cederholm’s book focuses on foolproof solutions to common Web design issues. It is engagingly written and beautifully lain out. With this book and a basic knowledge of CSS, you’ll be creating pages that not only look great, but make the Web a better place. Flexible layouts, rounded corner boxes, expandable navigation elements (tabs), and much more you can find in this New Web Bible. All chapters based on practical task, and that makes book more helpful and unbelievable interesting. Buy it, read it, live it!